LOUISVILLE MAGAZINE 7.18 87 Water Works By Katie Molck / Photos by Jessica Ebelhar Laura Patterson sits before one of four sewing machines in the cramped, canary-yellow room in her Highlands home on Bonnycastle Avenue. e space serves as a studio for Cannonball Swimwear, which she launched online in 2015. (Her late husband named the company after the Breeders song, not the classic pool jump.) Brightly colored swimsuits — pink with polka dots, striped green, black plaid — hang from wooden hangers on two garment racks. Patterson guides a new piece beneath the puttering machine, binding an elastic strip to black spandex. "Well, I guess the best thing to tell you is that I've been doing this my whole life," she says, a pin needle glinting in her mouth. Patterson was born and raised in Louisville (her slight Southern twang gives it away), and she learned the sewing basics from her mother, who worked in an upholstery shop in the basement of the owner's house. "I've been (sewing) since I was big enough to sit at a machine," Patterson says. "Before that, I used to hand-stitch, and before that I would make little tabs on things and tie them together." 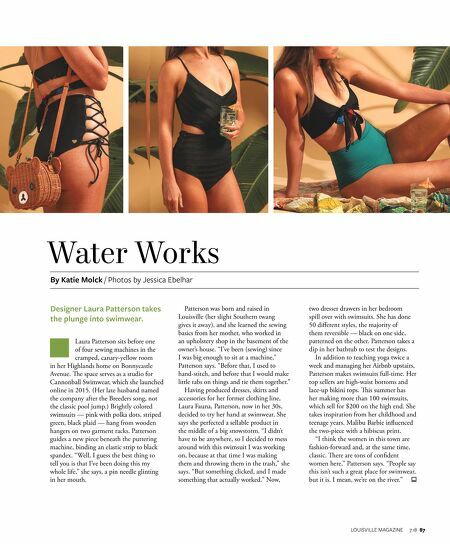 Having produced dresses, skirts and accessories for her former clothing line, Laura Fauna, Patterson, now in her 30s, decided to try her hand at swimwear. She says she perfected a sellable product in the middle of a big snowstorm. "I didn't have to be anywhere, so I decided to mess around with this swimsuit I was working on, because at that time I was making them and throwing them in the trash," she says. "But something clicked, and I made something that actually worked." Now, two dresser drawers in her bedroom spill over with swimsuits. She has done 50 different styles, the majority of them reversible — black on one side, patterned on the other. Patterson takes a dip in her bathtub to test the designs. In addition to teaching yoga twice a week and managing her Airbnb upstairs, Patterson makes swimsuits full-time. Her top sellers are high-waist bottoms and lace-up bikini tops. is summer has her making more than 100 swimsuits, which sell for $200 on the high end. She takes inspiration from her childhood and teenage years. Malibu Barbie influenced the two-piece with a hibiscus print. "I think the women in this town are fashion-forward and, at the same time, classic. ere are tons of confident women here," Patterson says. "People say this isn't such a great place for swimwear, but it is. I mean, we're on the river." Designer Laura Patterson takes the plunge into swimwear.